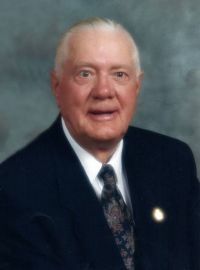 With sad hearts we announce the passing of Clifford William Beyers on July 20, 2012 in Carman, MB. He will be lovingly remembered and sadly missed by his devoted wife Marie along with his three sons and their families: Grant and his daughter Brittany; Doug and Kelley; Ken, Darlene, Lauren and Braden. He was predeceased by his parents Milton and Ada Beyers and his extended family Arnold and Kae Rach. Cliff was born on February 25th, 1924 in Saskatoon Saskatchewan. His mother passed away shortly after his birth. Cliff grew up with the William Bailey family in the Manitou and McFadden District. This extended family had a very special place in Cliff's heart throughout his life. Cliff joined the Air Force in 1942. After the war he went back to Manitou and farmed with his father until moving to Winnipeg in 1950. Cliff soon became involved working in the hotel business for 33 years until his retirement. Cliff met Marie in the summer of 1950 and together they enjoyed 59 years of marriage. They lived and raised their family in Winnipeg and retired in Carman. Our family would like to thank everyone for their kindness and compassion. Special thanks to all the staff at the Boyne Lodge for their personal and loving care. Funeral service will be held on Wednesday, July 25, 2012 at 10:00 a.m. at Doyle's Funeral Chapel with Karen Tjaden officiating. Interment will take place in Greenwood Cemetery, Carman. In lieu of flowers, if so desired, donations may be made to the charity of one's choice.